First saw this one in a DC House Ad, and the presence of the Flash meant that I had to have it. Another 7-11 purchase unless I miss my guess, and the second installment in the Wonder Woman’s twelve labors plotline. 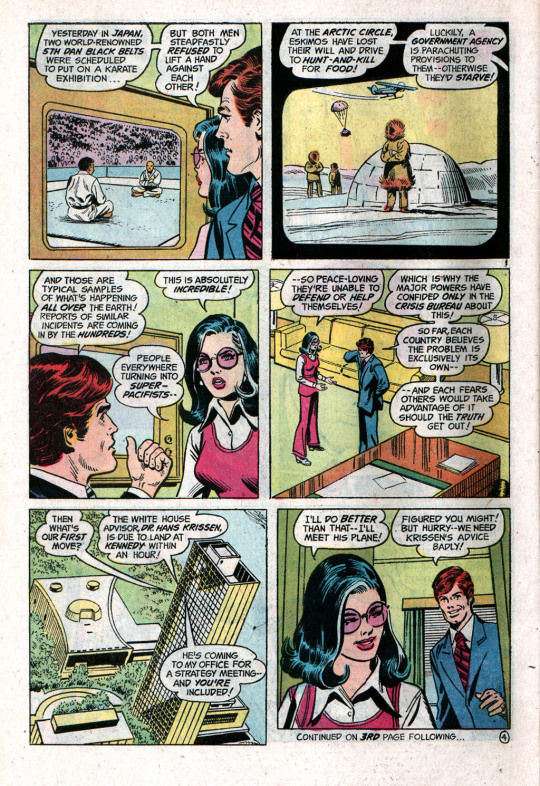 This particular issue of WONDER WOMAN was produced by Cary Bates and Irv Novick, the regular FLASH team, lending it a bit of additional familiarity. 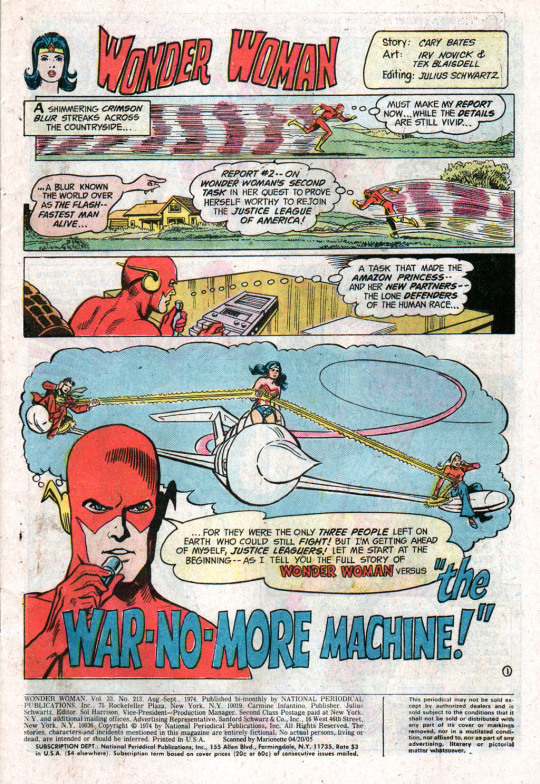 It seems that editor Julie Schwartz’s plan for the title was to rotate between the creative teams on the guest-starring JLA members, rather than having one regular writer and artist. The plot involves a robot from outer space which lands on Earth and begins beaming out rays that prevent violence and promote a peaceful state. Everyone on Earth is affected by these rays, with the exception of Wonder Woman and two other ordinary people, because they all happened to be in pain at the moment when the rays struck. The effect of the robot’s rays are all-pervasive. People won’t even hunt for food anymore, or kill dangerous insects. Even sports exhibitions are cancelled, as the athletes no longer want to compete with one another. 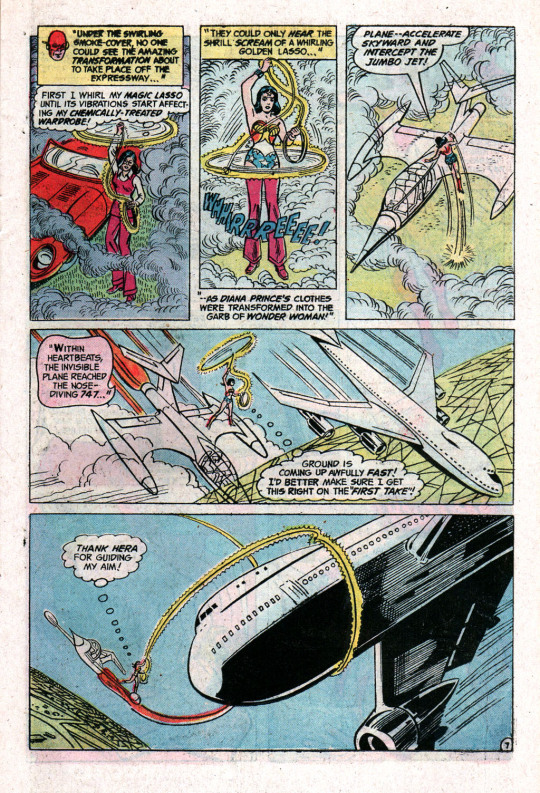 One of the tree remaining people on Earth who can commit violence attempts to hijack a plane, but in doing so, he causes it to tumble from the sky, requiring Wonder Woman to come to its aid. Returning to Paradise Island to try to figure out why she is immune to the soporific effect that has blanketed the Earth, Diana must first save her now-timid sisters from the attack of a rampaging Rhinotaur. Apparently, animals are immune from the effects of the robot’s rays. 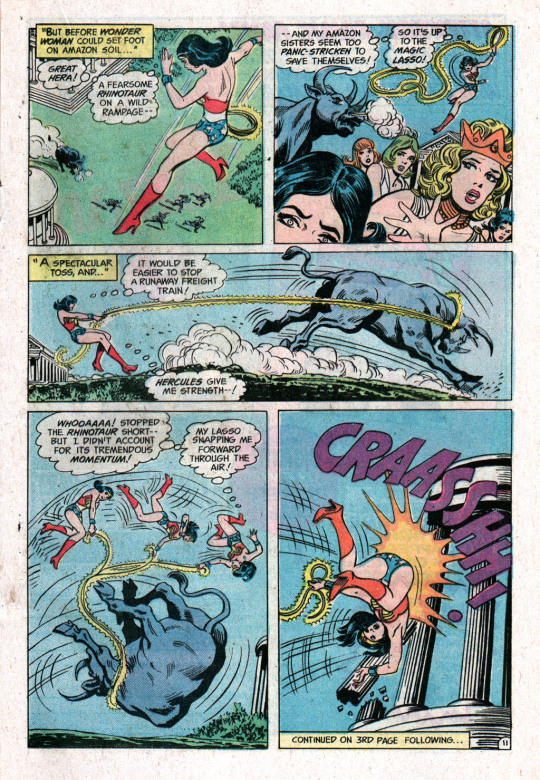 Wonder Woman uses the Amazon’s Magic Sphere to seek out the cause of this wave of non-violence. It tells her the backstory, and also alerts her to the fact that there are two other people who have not been struck down by its effects, the hijacker from earlier, and a protester. Diana collects them as well, figuring that she might need their aid. The two are reluctant, so Wonder Woman is forced to use her magic lasso to compel their aid, which seems a bit suspect to me. 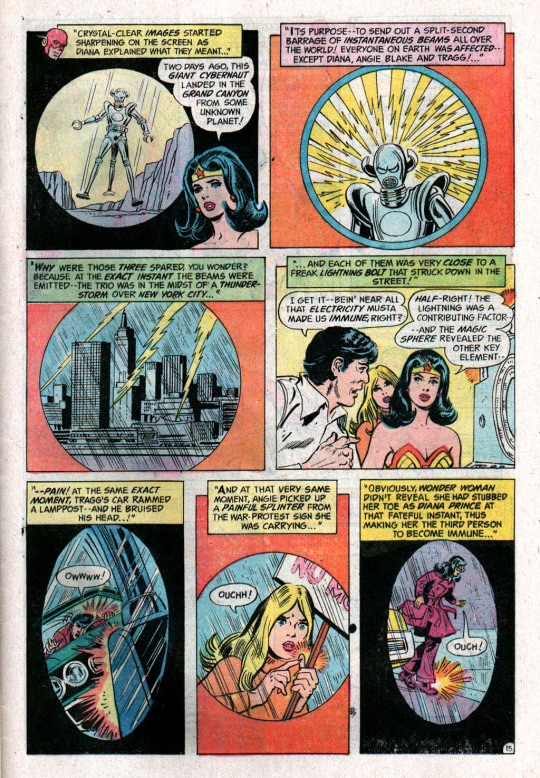 Locating the robot, Wonder Woman attacks, but is no match for its lethal strength. 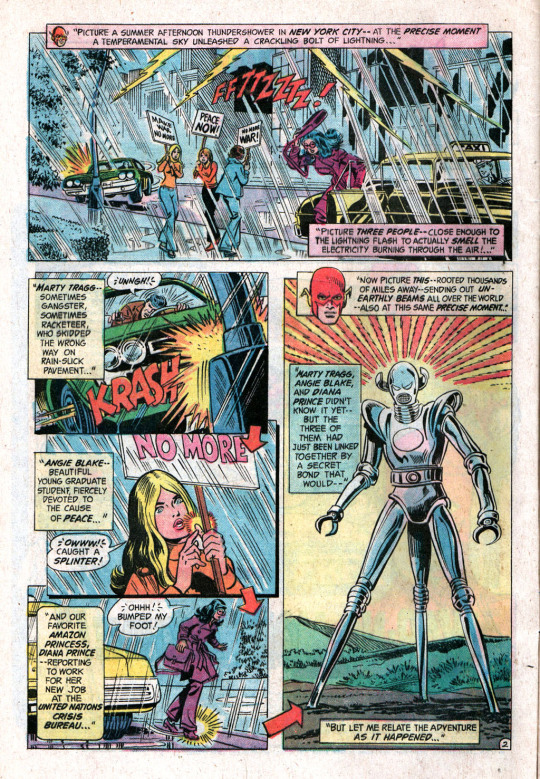 My most vivid memory of this story is the Flash running in place, unable to streak to her aid because of the non-violence rays (not that a rescue is necessarily violence, but I guess it counted to the aliens.) Fortunately, Diana’s two shanghaied partners find it within themselves to act. 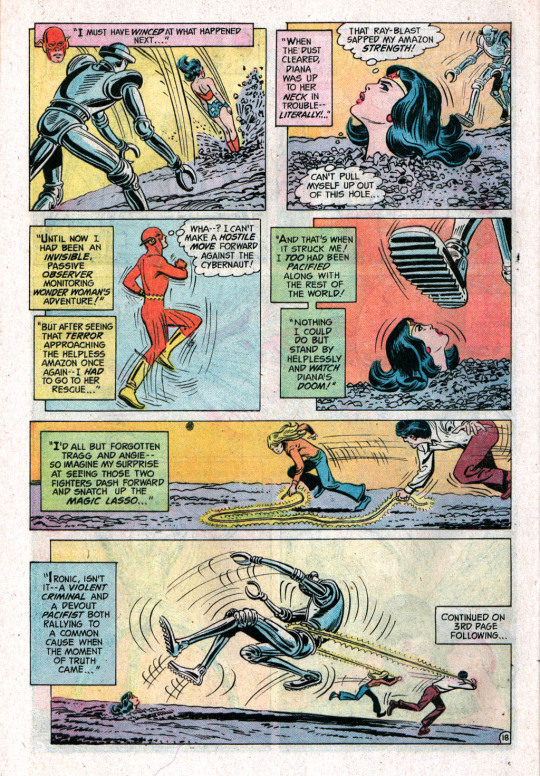 Using the magic lasso, they succeed in tripping up the robot, giving Wonder Woman a chance to free herself and then ultimately destroy the construct. 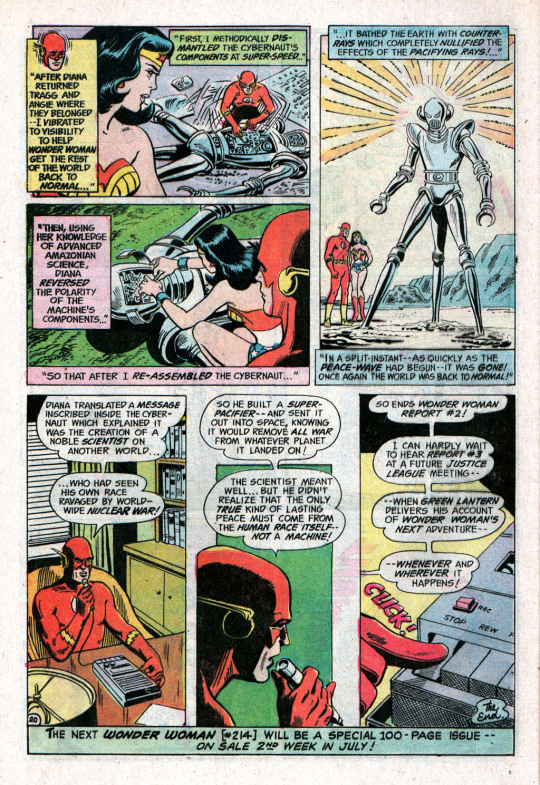 With the robot disabled, the Flash is able to assist Wonder Woman in reversing its effects on the world, and so everything is returned to normal. The Flash turns in his favorable report and indicates that it will be Green Lantern’s turn to monitor Wonder Woman next–a fact which meant that I would be on the lookout for that issue as well.